Large trucks are as popular as ever and in the Sierra, GMC has one that may interest you. The Sierra Denali is the top trim level, bringing lots of exterior chrome, interior trim and leather, and the payload and trailering capacities that shoppers demand. Pickup truck sales are booming and General Motors is well-positioned to meet that demand. It is the only company offering three full lines of pickup trucks — medium, full-size light-duty and heavy-duty models. And it does so under both the Chevrolet and GMC brands. GMC has a certain cachet that attracts a smaller, but more profitable segment of the consumer market. And to that end a pinnacle “Denali” trim level is offered with all the chrome, glitz and leather that allows GMC to assume the “luxury” mantle with these particular models. 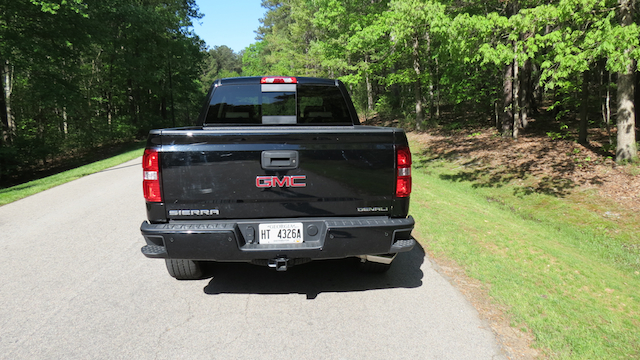 The GMC Sierra is the full-size pickup truck and a Denali 1500 4WD Crew Cab was a recent weekly visitor. It was the second go round of the model year for this type of truck, with an up level 2500 the previous test subject. No matter, when the press fleet distributor brings them, then I will test whatever is in my driveway. And this time I took said subject off road — briefly — but just long enough for me to see how it performed in muck, mire, slough and so forth. More about that sodden experience later. The standard Sierra is powered by a 4.3-liter V-6 engine making 285 horsepower and 305 foot-pounds of torque. 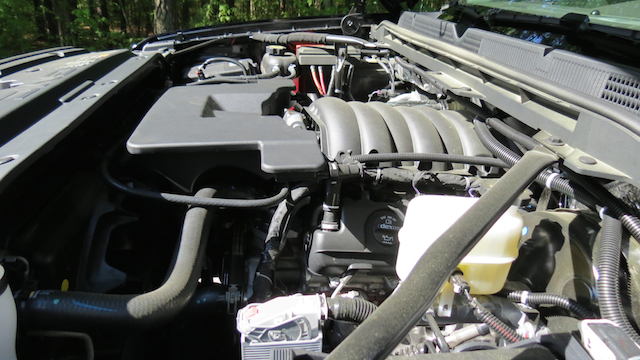 Engine choice number two of three is a 5.3-liter V-8 engine rated at 355 horsepower and 383 foot-pounds of torque. Your third choice is a colossal 6.2-liter V-8 engine making 420 horsepower and 460 foot-pounds of torque. The two smaller engines are paired with a six-speed automatic; the larger engine gets an eight-speed automatic. As tested, the Denali came with choice number three. Trucks of the Sierra Denali’s proportions seem imposing. And they are. The longest model, when equipped with a 6-foot-6-inches bed, is nearly 20 feet in length. Moreover, it spans more than 7 feet across with its mirrors and is just over six feet tall. That these models take up significant road space is a given. That they are also a bear to park in today’s smaller parking spaces may not be entirely grasped until you are driving one. 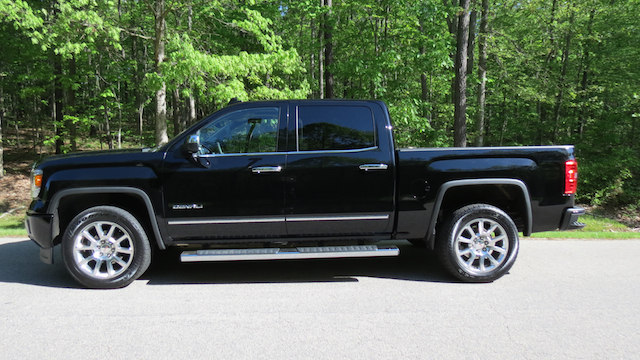 GM redesigned the GMC Sierra and its Chevrolet Silverado twin for the 2014 model year. That changeover preceded the much anticipated next generation Ford F-150, now sporting an aluminum body. Despite whatever edge Ford claims with the lighter material, the fuel economy differences are negligible — no more than 2 mpg between models. Furthermore, loyal buyers continue to flood GMC showrooms and are now considering the smaller Canyon too. Notably, the Canyon has not poached Sierra sales as GMC truck sales are up across the board. Certainly, you can thank $2.50 per gallon gasoline for that trend. All Sierra pickup trucks are marked by a massive grille, a long hood, strong shoulders, a slab side and a pickup truck bed. Indeed, there is not much to distinguish these models until you opt for various upgrades. Oh, yes, the side CornerSteps on the rear bumper are a welcome way to access the truck bed. Choose a Denali edition and you get chrome touches on the upper grille, the lower grille, the door handles, on the side mirrors, around the windows, and along the lower part of the doors. And if that isn’t enough, you get 20-inch ultra bright machined aluminum wheels. If bling isn’t your thing, then the Denali isn’t for you. Or pay for a customized blacked-out appearance package after the fact to rid yourself of at least some of the bedecked trappings. Inside, the GMC Sierra offers no compromise room for five. Not only that, but if you are a crew-centric commercial account, then you can swap the front bucket seats with a bench seat to gain a sixth spot. In doing so you lose the substantial and cavernous storage compartment splitting the front seats. But you do gain locking under-seat storage on SLE editions with the front bench seating. All seating positions are very comfortable in the Sierra Denali. 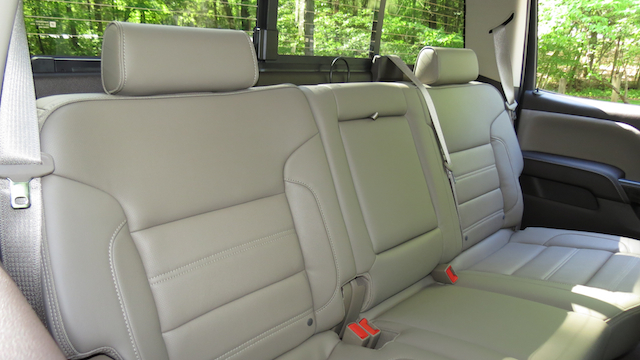 Specifically, GMC adds “dual-density seat foam” that holds its shape longer in a bid to maintain comfort. And the big guys sitting in the front bucket seats have all the room they need with generous amounts of head, shoulder, hip and leg room. To be sure, only the full size pickup trucks presents a suitable driving experience for the tallest people among us. Everything about the Sierra Denali seems large because it is. 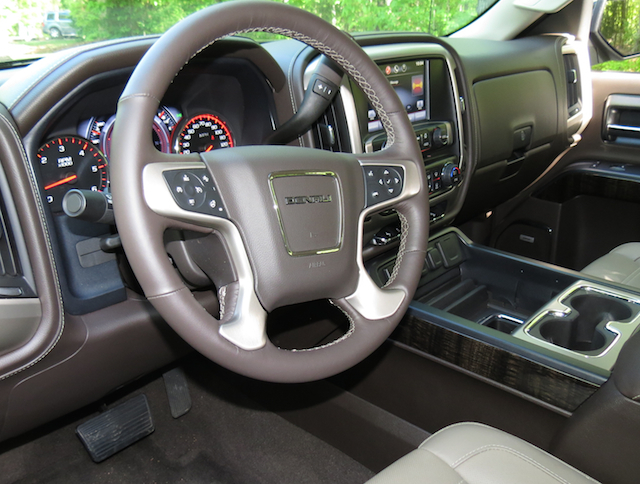 The instrument panel is upgraded from the standard Denali, with standard models featuring a six-analog display with tachometer and speedometer readouts dominating. Four smaller displays are at the top of the panel with a digital driver’s information center below these. However, in the Denali, you have two capacious analog read outs surrounding a digitalized compass and speedometer. Attached to either side of that center dial are oil pressure and fuel gauges. To the left of the steering wheel are the 4WD controls for four-wheel drive models. On the steerage wheel itself are the cruise and secondary audio controls. That steering column tilts and telescopes to allow you to find the ideal comfort position. With top-of-the-line models, memory settings allow you to save your seating position. One of my personal favorite designs for the Sierra Denali is its center stack. In fact, it is easy to comprehend and use, starting with the color display. That display features smartphone-like apps to gain additional information about navigation, climate control, audio and more. Beneath that are switches and dials for operating the audio system, climate control and a melange of other driver features. At the base of the center stack — at least in the Sierra Denali — is a dream formation of multiple USB ports, a 12-volt outlet, an auxiliary input port and a 110-volt outlet. Truly, the connectivity aspect along with the downreaching storage compartment suitable for hanging folders makes the Sierra Denali an office on wheels. Not to mention the 4G LTE feature that brings in WiFi for Internet access. All Sierra models come with a complete infotainment package, including an audio system. However, in the Denali you get a 7-speaker Bose audio system with subwoofer. 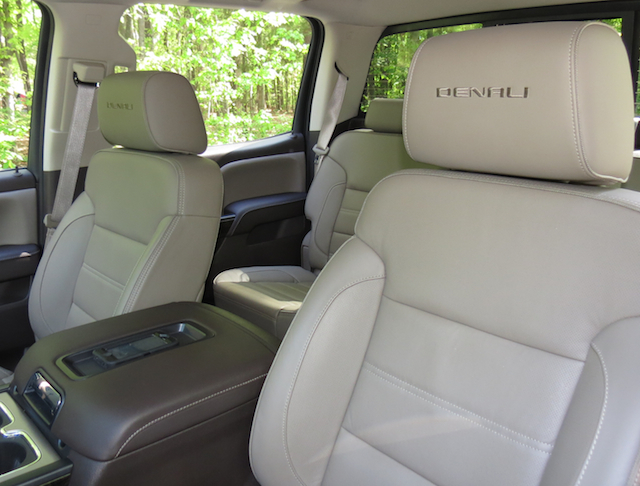 The Denali features multiple in-cabin storage areas. For example, you get an oversized two-tier glove box, and a storage well between the seats located just before the two cup holders, in door storage holders with drink holders, and an overhead console. Speaking about overhead, the Sierra Denali also has a sunroof. In many vehicles, the rear seating passengers may feel cheated. But not so with the Sierra Denali. For instance, if you were to place three large men side-by-side in the back seat, there is enough head, shoulder, hip and leg room to go around. With two people in the back, the center position converts to an oversized armrest and cup holder. Take to the road and the Sierra Denali has copious amounts of energy at the ready. From out of the gate and on to the highway, you have every bit of power at your disposal. The transmission shifts with confidence through each gear, although in the upper gears there were times it seemed to “hunt” or hesitate for the next gear. Off-roading is one feature of the Sierra Denali 4×4 that should be attempted to be fully appreciated. It may seem a bit of an oddity to some that such a “pretty” truck should do off-road duty, but it does so without drama. Don’t mistake its visage for being anything less than a beastly workhorse. One of my favorite places to take a 4×4 is a clay bog about 20 miles from my home. At first glance, the morass leading to a hunting club’s entrance seems nothing more than a puddle. But if you do not come properly equipped, you will discover that the moor quickly becomes a quagmire. It is also the perfect place to test out your 4×4 system. A certain section of that morass is especially muddy. Thus, switching from 4×4 high to low may be necessary, especially if your tires are more of the on-road variety. Not once was I stuck, although I kicked up enough red, oozy mud to make it appear as if I did engage in an all-day 4×4 affair. In the event that you do get stuck, the Sierra Denali has a pair of tow hooks up front for your extrication. People may shop for a Sierra Denali for its large cabin, high-end amenities and its ton-plus payload capacity, but trailering may be the overarching factor for some. To enumerate, minimum towing for the 4×2 model is 5,500 pounds. But with the trailering package included, your towing capacity leaps to a robustious 12,000 pounds. However, the 4×4 edition offers minimum towing of 7,100 pounds and tops out at 11,900 pounds. As you can see the Sierra Denali offers a complete package that seems to satiate the desires of many. If you find the Sierra too big of a package for your needs, then take heart as there is a Canyon model with Denali trim that can meet your needs. Either way, you have access to trucks that deliver what owners insist on in a variety of sizes and trim levels. 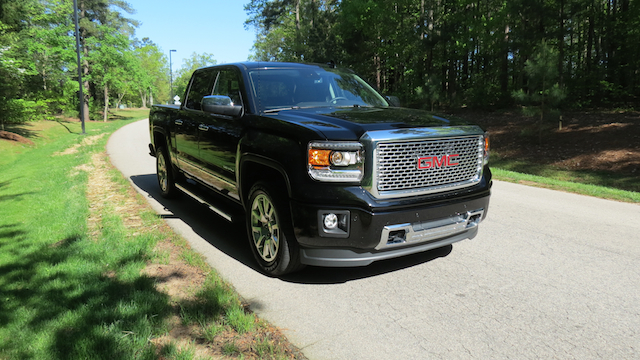 2015 GMC Sierra Denali photos copyright Auto Trends Magazine.